The purpose of my (second) most recent* trip to Cumulus Inc was to meet up with a good friend from my uni days, The Weekend Farmer. By day The Weekend Farmer is a high-flying construction lawyer, who seems to spend the bulk of his time in airport lounges and on flights en route to exotic locations. However, by night (okay, by the weekend), The Weekend Framer lives a very different, slower-placed life in rural Brisbane with dogs, chickens and a lawn that can only be tamed with a slasher (as someone who does not even have a lawn, I don’t even know what a slasher is!). (*Note: For the purpose of this post, the term ‘recent’ means months ago). 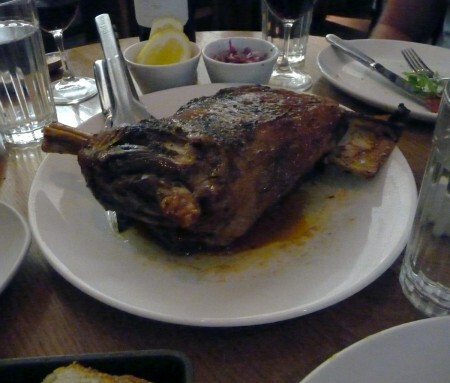 As a frequent flyer, The Weekend Farmer finds himself in Melbourne on a semi-regular basis. Over the past few trips I had exhausted my supply of CBD dinner favorites, so I decided to try my luck and gamble on the no-bookings policy at Cumulus Inc. Fortunately, The Weekend Farmer managed to sneak into the bar at Cumulus Inc just before 7pm and by the time he had finished his first pre-dinner drink , a table for 3 become available – just as The Brooding Architect and I walked in the door. Cumulus Inc is located in a large warehouse-style space at the top end of Flinders Lane. The space is a little on the noisy side, but is perfect for a boisterous, relaxed dinner with friends, preferably fueled by plenty of wine. 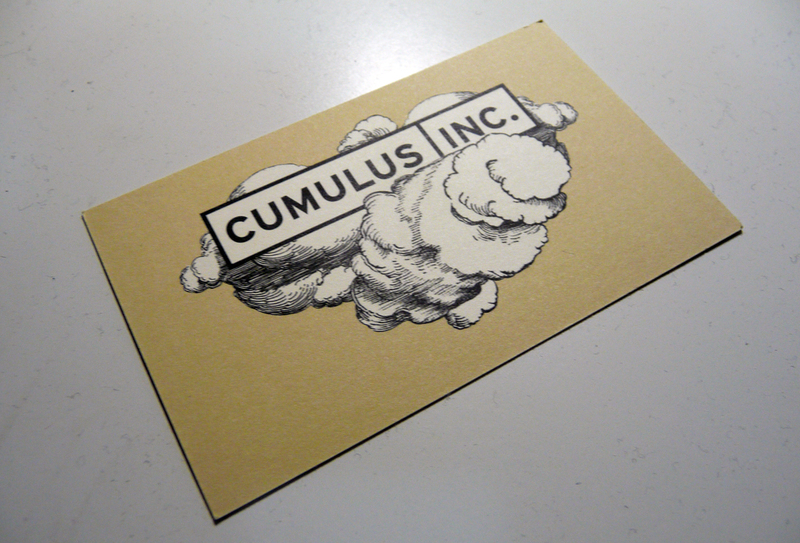 I personally don’t think of Cumulus Inc as overly romantic or intimate (i.e. not an ideal date venue), but one of my friend’s – whose identity cannot be revealed in the interests of preserving his romantic track record – swears that Cumulus Inc is his “100% restaurant”. Perhaps an experiment is in order for some of my foot loose and fancy free readers? Our meal at Cumulus Inc came to the grand total of $297 – well worth it for a special occasion meal. The price included a pre-dinner drink each (2 G&Ts and a Mount Gay Rum), a bottle of decent pinot noir ($75 – though there are lots of cheaper wine options on the menu – including a great Argentinian red which is a bargain at $45 a bottle), post dinner coffees, stacks of food and 3 desserts. At less than $100 a head you would be hard pressed to find better value for the same quality and quantity of food and wine in the CBD. While we umm-ed and ahh-ed over the menu, we started with some very well received complementary bread, with lashings of butter on the side. We were meant to start our meal with some oysters – a mix of Cofifn Bay ($3.50 each) and Moonlight Flat ($4.00 each) - but due to a mix up with the order, the oysters were only sent out after we had tucked into the Soft Shell Crab special ($14) and one of Cumulus Inc’s signature dishes, the Slow Cooked Octopus with aioli and dehydrated olive ($10). 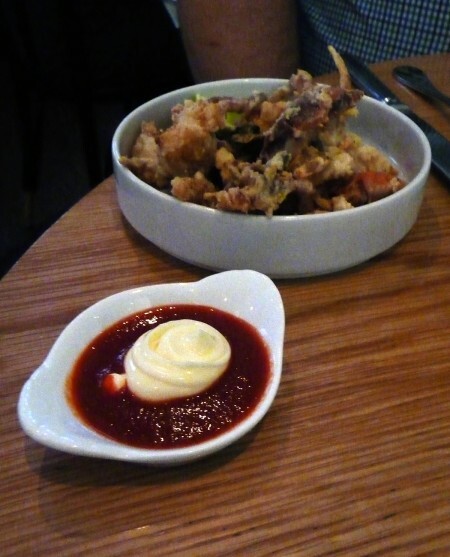 The Soft Shell Crab was covered in a golden tempura batter, with side of zesty chilli sauce and creamy Japanese style mayonnaise. The crab meat was sweet and delicate, contrasting wonderfully with the ‘crunch’ of the tempura and the spicy chilli sauce. The Slow Cooked Octopus is a really interesting dish – full of really interesting flavours and textures. The octopus has a similar texture to the marinated (or pickled) octopus you can buy at a Mediterranean deli. The octopus is topped with a generous amount of good quality olive oil, as well as some deceptively spicy aioli and dehydrated olive. I loved the flavours so much that I asked for some extra bread to mop up the leftover oil and spicy aioli. When the oysters finally did arrive – with multiple apologies from our waitress – they were gorgeous, plump and creamy. 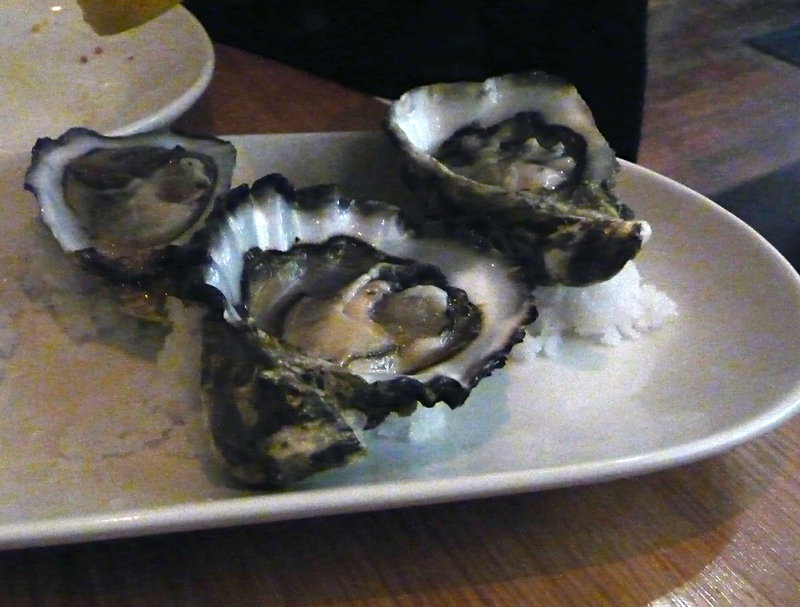 The oysters are served naturally – as all good oysters should be – on a bed of salt, with plenty of lemon wedges. (As a side note, if you are a big oyster fan like me, Cumulus Inc is hosting an oyster shucking session as part of the Melbourne Food & Wine Festival. Booking details can be found here). We then moved onto the more substantial dishes. I was really keen to order the whole roasted lamb shoulder to share, but with only three people we thought that it could be a tad ambitious. Instead we shared a few of the specials – the ‘man-size’ Rangers Valley Sirloin ($58) and Fresh Buffalo Milk Haloumi ($19), with some Spiced Cauliflower ($15) and Roasted Kipfler Potatoes ($9) on the side. 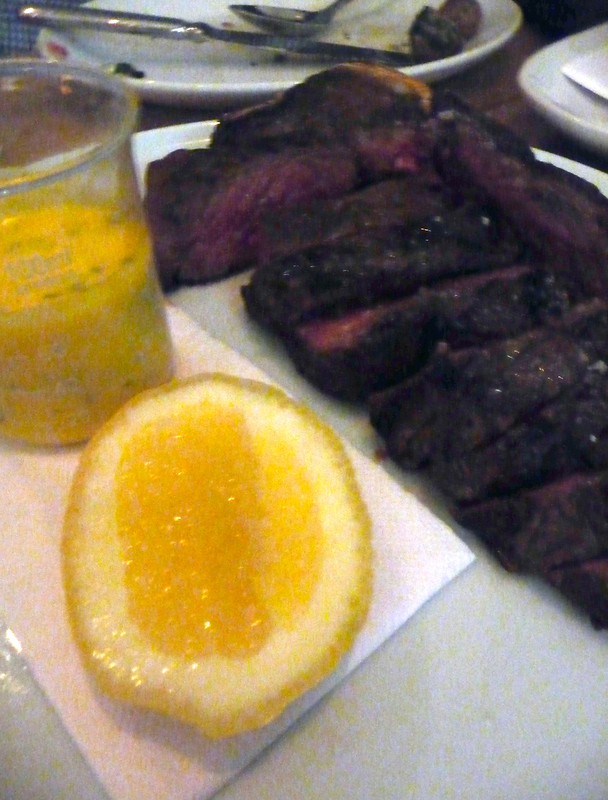 The Rangers Valley Sirloin was a huge, man-size piece of aged beef on the bone, with a side of creamy Bearnaise sauce. The Sirloin was cooked to medium-rare perfection. It was juicy and full of flavour. 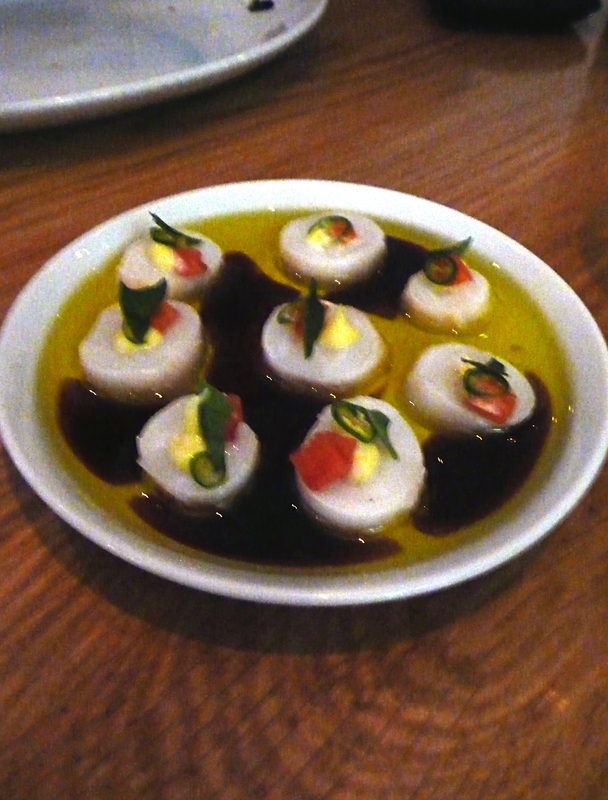 What I really like about Cumulus Inc, is that they make really simple food special by using fantastic quality produce. For example, a simple dish of grilled haloumi served with lemon wedges is made extra special by using buffalo milk haloumi in place of the usual goats or sheep’s milk variety. 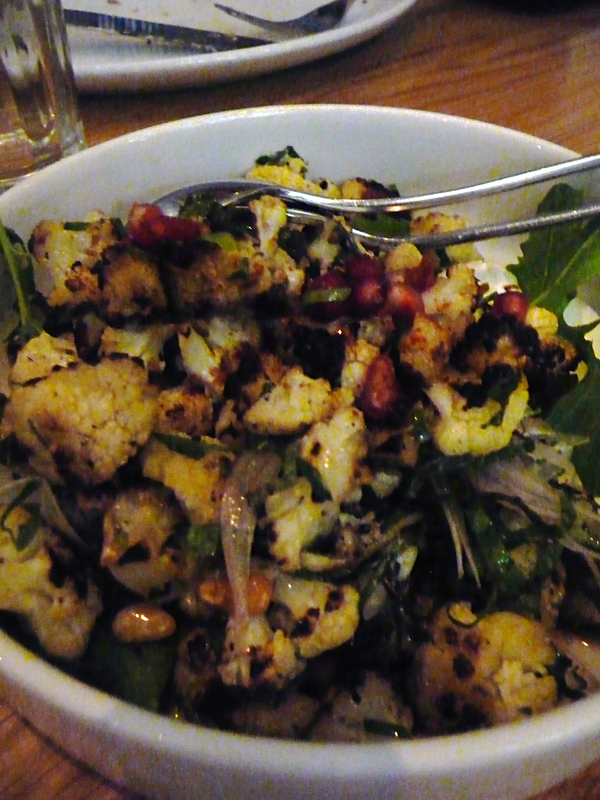 Another example is the Cumulus Inc take on the humble cauliflower. The Spiced Cauliflower is a lovely combination of nutty roasted cauliflower (with those lovely caramelised sticky dark bits on the edges), with sharp tangy goats cheese and lovely fresh pomegranate seeds which add a refreshing ‘pop’ of flavour to every mouthful. Well worth ordering if you are dining with a cauliflower skeptic (AKA, The Brooding Architect). What I love most about meeting up with The Weekend Farmer, is that we never even have to pretend that you we are going to skip dessert. 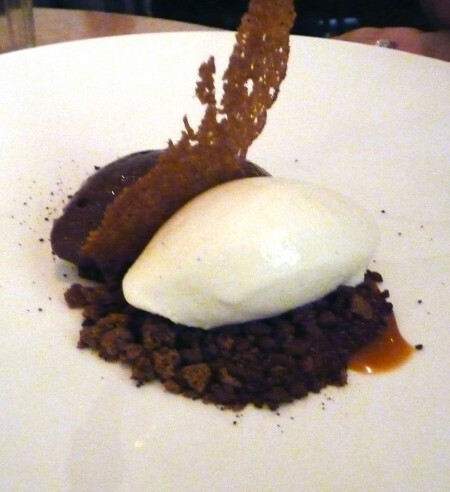 I ordered the Pearl Barley Ice Cream, Soft Chocolate, Caramel and Rye ($17). The barley ice-cream was soft and creamy, a lovely contrast to the rich and decadent chocolate mousse. The side of crumbly rye biscuit pieces and a thick caramel sauce, adding wonderful texture and crunch. Plus, this is definitely not something you could not easily cook at home, thereby fulfilling my ‘special dessert’ criteria. 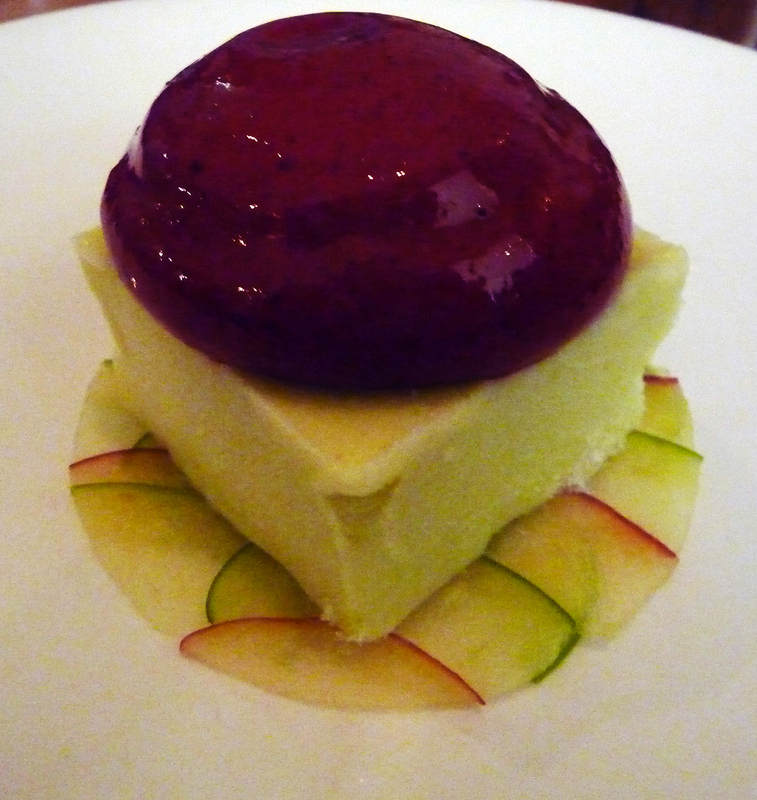 The Brooding Architect literally inhaled the delicate Apple Parfait with Blackberry Mousse ($14). This dessert is light and refreshing – perfect if you really want something sweet, but over indulged at dinner. 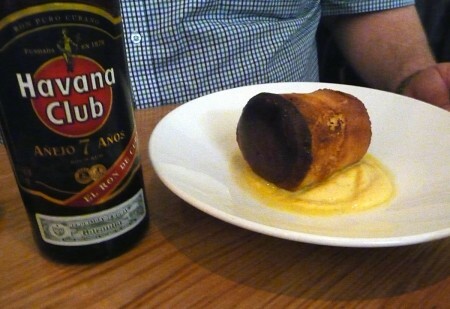 However, I think that that The Weekend Farmer ordered the stand out dessert though, the Rum Baba ($17) served with an ENTIRE bottle of aged rum on the side. By anyone standards, that is a pretty substantial night cap.